A major hazard to backcountry users in the Marble Range is lack of water at higher elevations. In the spring and early summer it is usually possible to find and melt snow for drinking water. Later in the season you must carry all the water you need if you plan to camp in the alpine or subalpine. As for all backcountry areas, surface water should be boiled or treated. 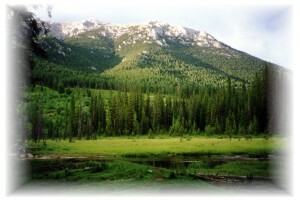 The park is a wilderness area that is not regularly serviced or patrolled. Since trails are unmarked and tend to be obscure in places, you must carry a topographic map and compass or GPS unit, and know how to use them. Tell a responsible person your destination and expected return time before you go. Marble Range Park is so named because of its unusual karst (limestone) topography. These mountains feature caves, sinkholes and disappearing streams, as well as cliffs, chasms, and crenellated ridges. The park protects populations of California bighorn sheep and mule deer. There are some rough trails, popular with local hikers, hunters and horseback riders. Special Features: Limestone karst formations can be accessed and viewed from high in the alpine. The trails of the Marble Range are rough and steep, not maintained and only very infrequently patrolled. Please practice “No Trace” camping and day-use. Wildlife viewing is popular in the Marble Range. Please remember your binoculars and telephoto lenses, as keeping your distance will minimize disturbance to the California bighorn sheep and other animals. History - Marble Range Park was established in 1995. Under the Cariboo-Chilcotin Land-use Plan, uses that were permitted before 1995 will continue in the park: livestock grazing, hunting, trapping and guiding. In 2013, 2,215 hectares were added to the park as part of the Cariboo-Chilcotin Land-use Plan (special feature) process. Cultural Heritage - Marble Range Park is within the traditional territory of the Shuswap People. Three First Nations continue to use the park for sustenance, spiritual and cultural purposes. If you find any First Nations heritage sites, do not disturb them or remove anything - they are protected under the Heritage Conservation Act. Conservation - The principal reasons for the protection of the Marble Range area were for: the preservation of alpine and subalpine habitats in the Pavillion Ranges Ecosection (PAR), the preservation of endangered and non-endangered wildlife and their habitat (e.g., bighorn sheep, mule deer and cougar) and for high back-country recreation values. The park is located within the Pavilion Ranges, and protects mostly mid- to high elevation ecosystems. The forests contain old growth Douglas-fir, spruce, lodgepole and whitebark pine, ranging into subalpine parklands and extensive alpine tundra. The karst topography is unusual in BC, and is protected in only a few other parks, mostly on Vancouver Island. Soils in the area are high in calcium, so they support a number of rare plants. Wildlife - Wildlife viewing is popular in the Marble Range. Please remember your binoculars and telephoto lenses, as keeping your distance will minimize disturbance to the California bighorn sheep and other animals. The park, along with the nearby Edge Hills Park provides important habitat for species that require large, diverse ecosystems, such as cougar and black bear. The Marble Range is excellent as mule deer summer range. Every year, California bighorn sheep migrate between alpine areas in the Marble Range and steep cliffs of the Fraser River canyon in Edge Hills Provincial Park. The migration is dictated by food availability. Sheep will winter in the warmth of the canyon, where tender green shoots begin to grow early in the season. Here, the sheep also encounter less snow, and have access to steep and rugged terrain for protection from predators. In early summer, the sheep migrate to alpine areas in the Marble Range. Over the past 40 to 50 years, many of these routes have been abandoned, with only a few routes remaining. A three year study has been initiated by the Clinton and District Outdoor Sportsmen Association in order to determine exactly where the migration routes are. The results will assist in future management decisions. The approved Marble Range/Edge Hills Management Plan is available in PDF format. Because of the large size of the file, the plan is divided into eleven separate files for ease of access. The trails of the Marble Range are rough and steep, not maintained, and very infrequently patrolled. For your own safety and the preservation of the park, obey posted signs and keep to designated trails. Shortcutting trails destroys plant life and soil structure. Horseback riding is popular in the Marble Range, and may be arranged through several guest ranches in the area. If you must have a fire, please burn only dead and down wood, and be sure to extinguish the fire fully. Dead wood is an important habitat element for many plants and animals and it adds organic matter to the soil so please use it conservatively, if at all. Be prepared to bring a portable stove for cooking. Wilderness, backcountry or walk-in camping is allowed, but no facilities are provided. The park is open year-round if accessible.